Storing paper charts is far from ideal. They take up space and they are hard to organize, so when I needed that cool figurative language chart with the umbrella I had to dig till I found it. Not the best use of my time. So in August I started taking pictures of the charts I knew I would want to use again. The problem is I'm not good about organizing my photos either and scrolling through my camera roll was almost as bad as digging through old charts. I created a new blog with Blogger. 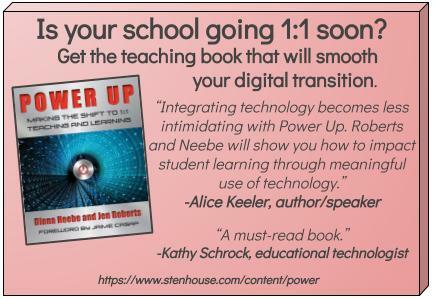 I called it classroomcharts.blogspot.com (I was amazed it was available.) I went into the settings of my new blog and added a secret word email address. To add pictures to the blog I just email them to that new address and they appear as posts. Once I had sent one picture using the secret word email address for my blog, my phone remembered that address and made it super easy to send more pictures. From my camera roll I pick the chart I want to send, I usually edit it to crop out edges and the auto enhance makes it look a bit better. Then I send the photo by email with the title of the chart as the subject line. Voila, a few moments later the chart posts to my classroom charts blog and I can find it again easily later. To make your own you'll first need to create a blog. If you've never done that before there is probably a "create blog" button in the upper right corner of this blog you are reading right now. There is a pretty good tutorial here. 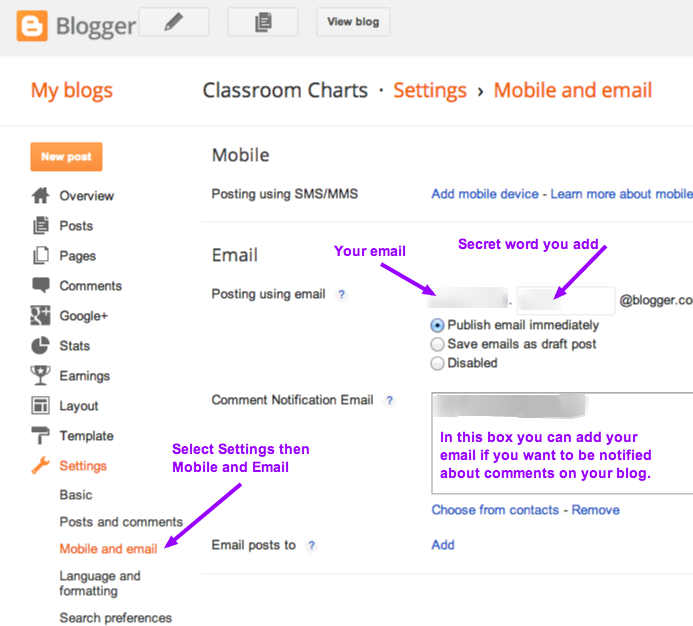 Then you'll need to adjust your blog settings to accept email submissions. The screen shot below will help. Click this picture to see it larger. Because the charts blog is all photos I chose a dynamic page layout and I use the flipcard version. This makes it easier for me to see as many charts as possible at once on my screen. Most of the charts I post come from my own classroom, but when I see something great in another classroom I snap a quick picture and ask my colleague if I can post it on the blog. My students and colleagues can easily access all of the charts. If I want to include a chart in a blog post I am writing for my class I can get a URL for it from the charts blog and add it quickly. When I work with other teachers and they have a question about something I do it is easy to pull up the charts blog and show them an example. I hope you will start a charts blog for yourself. If you are an English teacher there may be charts on my blog you want to duplicate for your own classroom. Marker Tip: I've tried a lot of markers, but I find the scented ones from Mr. Sketch are the best for me. Their colors stay bright for the longest. Other more popular brands fade fast and make charts look old quickly.